We have the particular expertise in the spray drying which can be used to improve API properties and develop amorphous solid dispersions for increased drug solubility and bioavailability. Fuji has world-class capabilities developed over decades of experiences and offer customized services to support projects from the early-stage development through commercial production. In responding to the customer demand, Fuji is expanding the spray drying facility in summer 2015 in addition to the current Open Cycle and Closed Cycle Spray Drying facility. 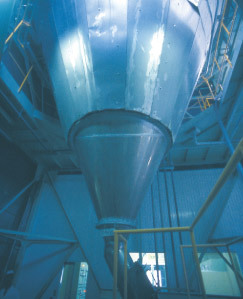 The state of the art Commercial-scale Closed Cycle Spray Drying facility will be installed. Are you looking for a custom spray drying service compliant with cGMP? At Fuji Chemical, we offer SD technology that lives up to or exceeds your expectations. 4. Orally disintegrating tablet system - F-MELT® system. Our annual production exceeds 2,000 tons of spray dried pharmaceuticals. cGMP spray dryers are available to meet your commercial needs. Integrating our SD skills with excipient expertise, we enhance the value of APIs and provide customized Drug Delivery System (DDS) and technologies. We are the first company to offer custom SD services for pharmaceuticals in Japan. An excellent track record over the past 45 years and a strong R&D keeps us at the forefront of providing SD solutions.